1. Install gauges and check operating pressures. 2. Check voltage and amperage to all motors with meter. 3. Check CFM across evaporator coils. 4. Check for adequate refrigerant charge and possible leak. 6. Lubricate all moving parts. 7. Check belt and adjust tension. 8. Check and/or change filter. 9. Check pressure switch cut-out settings. 10. Check start capacitor and potential relay (if applicable). 13. Check and adjust thermostat. During an HVAC inspection we will visit your home or office and conduct a complete inspection closely analyzing your HVAC system to see exactly what requires attention when it comes to your heating & cooling needs. We currently perform inspections for local realtors in the area. Our licensed and trained HVAC technicians can professionally install many different types of heating and cooling equipment. 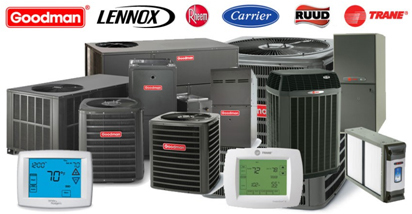 We can perform from the ground up, replace your exisiting unit or modify your current system.